Claudionor Viana Teles Velloso, or Dona Canô, is a 103-year-old beloved lady and mother of the famous Brazilian artists Caetano Veloso e Maria Bethânia. She's so charismatic that became a personality by herself and not only for being their mother. Velloso's family photos were googled. Background by Smoko-Stock (deviantArt). The text is actually excerpts from the lyrics of the song Dona Canô you can hear by clicking below. wonderful array of memories, great idea! What a wonderful montage, each element well chosen and presented in such warm, vibrant colors. Beautiful, Christine! PHEW have blogger trouble to write comments ! It's my third try ! Gosh she has a LOT to memorize Christine ! Dona Cano has many happy memories and is looking out of her window so optimistically at 103 that I'm sure she will enjoy what time is left to her. Wonderful Chris I love the beautiful background but Dona Cano's reflection in the window is exquisite...How wonderful to be a lady like her it is inspiring thank you for sharing her with us. I love the look on your Lady's face. Wow a beautiful and thoughtful collage - a window to all that makes life memorable! Beautiful collage and artfully creation. An homage to Dona Cano, and beautifully done!!! 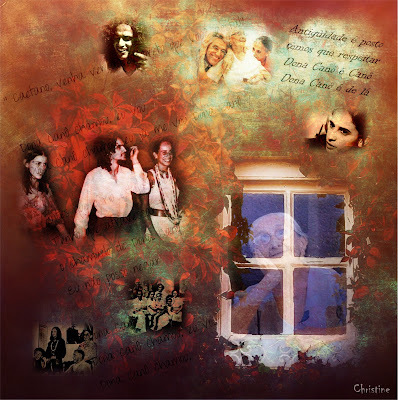 A beautiful montage, Chris, and a tribute to Dona Cano. Fantastic. I don't know anything about these Brazilian artists, but you certainly made a beautiful collage about the family's memories. She must be a very proud mother. Beautiful collage...lots of food for thought! Hi Christine, Thank you for your lovely comment on my blog. I did sketch the face myself. I love to draw, especially faces and then I incorporated the face into the digital background. Next month I will be taking an online class with Katie Kendricks and will be focusing on painting, and textures using acrylics, and mixed media. I'll share what I'm up to on my blog. Hope you stop by!